I am very fond of karavali food or Mangalore food. Staying in Mangalore for my education , I got to know about this dosa from my friends tiffin boxes. Since my younger brother sticks to chapati's and paratha's , mom rarely used to make this. But after marriage, situation entirely changed and my hubby and son prefer dosa's and idli's than Chapati's. So I prepare this atleast once in a week. Ok. Coming back to the term NEER DOSA. In Kannada, Neer means Water. The batter is of watery consistency so dosa's comes out very thin and you end up eating more than you consume the normal dosa's. I would like to add this to my instant dosa category too, as it doesnot need any time to ferment and every time when I get a last minute call about guests arriving home the next day, you will surely find Neer dosa also known as coconut dosa in my menu. When you visit these Mangalorean restaurants and ask for neer dosa's, they surely very recommend having this with Koli( means Chicken) Curry or Mangalorean style Chicken Sukka. I would like to add Fish curry and Prawns Sukka as a side dish to this. I will post the recipes later some time. For vegetarians, this goes well with Coconut chutney , Tomato Chutney, Vegatable Sagu or even Chutney pudi(powder) will also do. Water and Salt as needed. 1. Soak Dosa rice for atleast 2 hours. If you are planning to make this dosa for breakfast, soak it over night and grind it in the morning as i do. 2. Blend this soaked rice with grated coconut in a mixture to a smooth paste. Shift it to a bowl and add more water to this so that the batter gets thin and watery consistency. Add salt to taste. 3. Heat Dosa pan and grease it with little oil. Pour a laddle full of batter and tilt the tava immediately so that the batter runs all over to get a thin dosa. Cover it and cook for less than a minute. Fold it an serve hot. This needs practice. Don't try to flip the dosa's else it will break. 4. Serve hot with any side dish mentioned above. 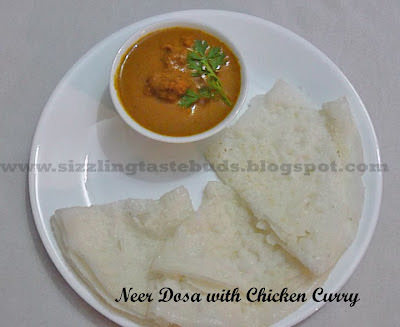 Neer Dosa/coconut dosa is entirely different from normal dosa's. It won't be crispy.